With the opening to the public of the Museum of African-American History and Culture on Saturday, September 24, behind the scenes work of over a hundred years of hard work raising awareness, raising funds, gathering materials and tons of other important necessities to making a modern museum for a History that dates to hundreds of years, have finally really reached a glorious completion. President Obama opened the museum with the ringing of the historic Freedom Bell from the First Baptist Church in Williamsburg, Virginia,a church which was organized in 1776 by slaves. 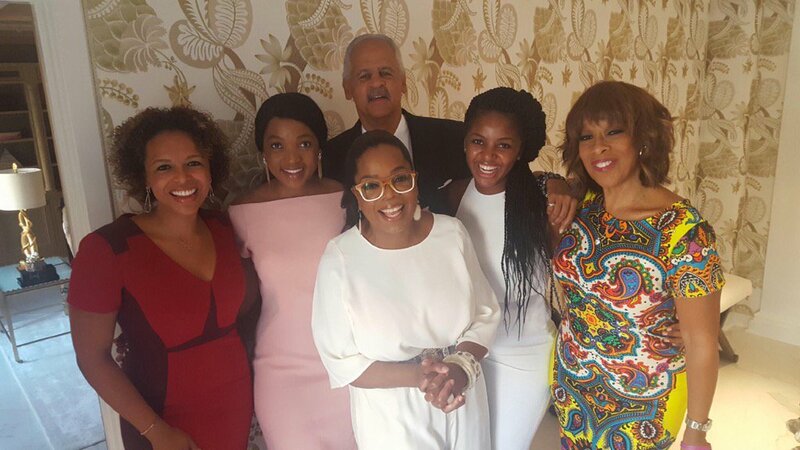 We have ALL MET – oh, not really – BUT WE ALL KNOW OPRAH – well, sort of! Off to celebrate @NMAAHC ! What a mighty powerful day. 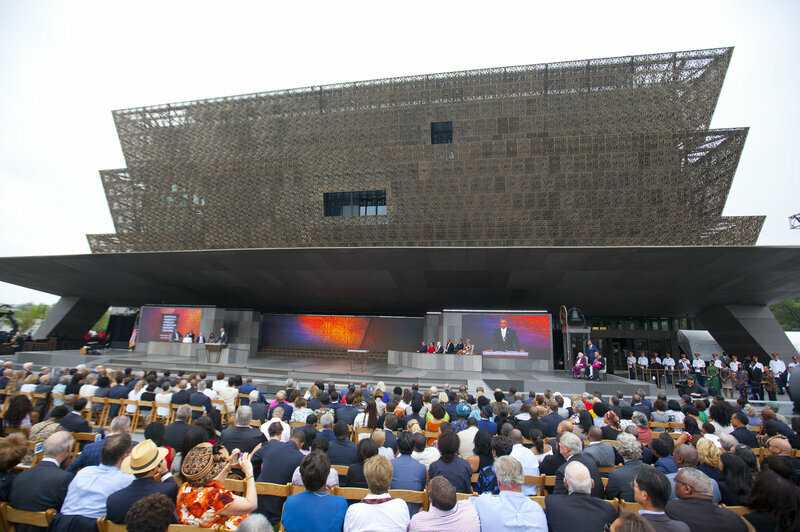 When it opens, the National Museum of African American History and Culture in Washington, D.C., will be the only national museum devoted exclusively to the documentation of African-American life, history and culture. 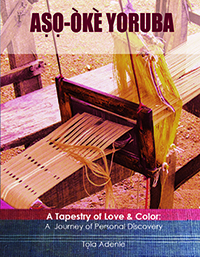 Telling its stories, for instance. Through his donation to the museum, visitors will be able to leverage the power of technology to chronicle and share personal narratives — whether they are standing in the building or logged on from home across the world. Smith says he is often reminded he is still a black man in this country. At least three to seven times a year, he says, he is stopped by police as he drives himself to the airport in Texas. The officers run his tags and check his license. He’s told he was speeding or changed lanes without signaling. The officers send him off, often without a ticket. But Smith never worries about missing his flight. His private plane won’t leave without him. When peals ring out from a 130-year-old church bell at the Sept. 24 dedication ceremony for the National Museum of African American History and Culture, they will signal the end of a long journey. The historic “Freedom Bell” usually hangs in Williamsburg, Va., in the tower of the First Baptist Church, which was founded by slaves. It started making its way to Washington, D.C., on Monday, according to The Associated Press, in order to herald this latest historical event. 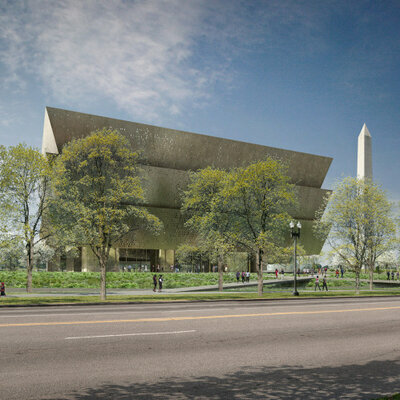 African-American Museum Breaks Ground In D.C.
“The connection between a congregation founded in 1776, the forging of First Baptist Church, the first black president opening the first national African-American museum, all of those dots are being connected,” the Rev. Reginald Davis told WVEC. But in truth, it took more than a few people, and a century’s worth of starts and stops, to shift the museum from conversation to construction. President Barack Obama speaks during the dedication ceremony for the Smithsonian Museum of African American History and Culture on the National Mall in Washington. Three years later, Dyer — who also authored the 1918 Dyer Anti-Lynching bill — upped the ante and drafted a bill to erect an African-American monument in the capital. InBegin with the Past: Building the National Museum of African American History and Culture, author Mabel Wilson writes that Dyer’s 1919 bill “sparked a round of discussions among the various committees overseeing federal land.” There was even talk of building the memorial on the National Mall, but a decision on how to pay for it was put off. In 1929, things looked hopeful again when Congress passed legislation establishing a commission charged with building an African-American memorial. But once again, no money was allocated for it — it was the Depression — and the project lost momentum. The museum gained new champions during the civil rights era, but it wasn’t until 1986 that Congress passed a joint resolution supporting private efforts to build it. The efforts inched forward in 1991 when a Smithsonian blue-ribbon commission pushed for creation of the museum, recommending that the iconic, red-brick Arts and Industries Building be its temporary home. But political squabbles over funding and a site location stymied that effort. The arrival of the new millennium, however, seemed to bring with it new momentum to get the museum built. In 2003, Congress passed the National Museum of African American History and Culture Act, a bill making the museum part of the Smithsonian Institution. Over the next few years, a board was selected and more than $240 million was raised from donors such as Oprah’s Charitable Foundation, Samuel L. Jackson and his family, Michael Jordan and his family, the LeBron James Family Foundation, the Kobe and Vanessa Bryant Family Foundation, Earvin and Cookie Johnson and family, and Mellody Hobson and George Lucas. The federal government kicked in $270 million. “They took advantage of having the first African-American president, and of President Obama’s legacy,” Emmett Carson, president and chief executive of the Silicon Valley Community Foundation and an authority on African-American giving, told The Washington Post in May. 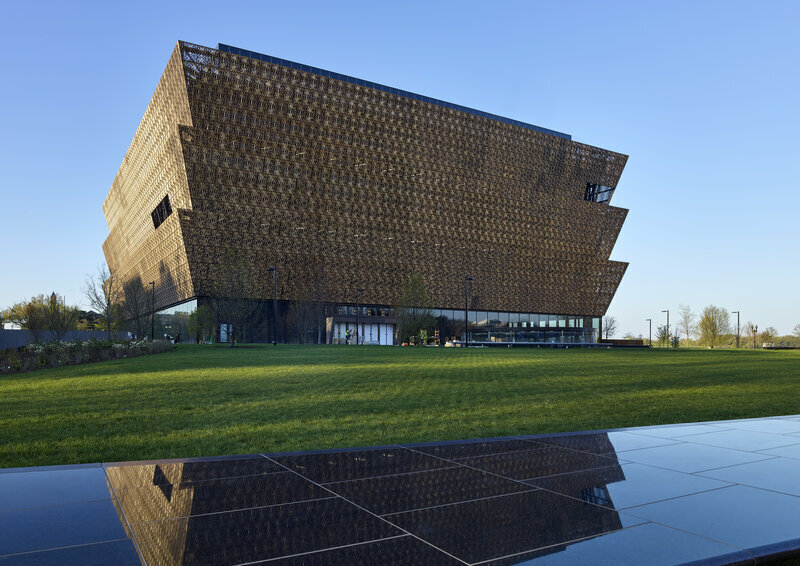 The Freelon Adjaye Bond/SmithGroup, which designed the winning concept for the National Museum of African American History and Culture, met with Smithsonian Institution members in April 2009. 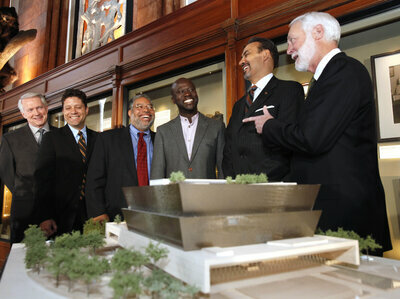 David Adjaye (third from right) and Phil Freelon (second from right) pulled ideas from cultural icons for their design. The other pieces fell into place once the location was decided in 2006: an architecture design team selected in 2009, and finally, in February 2012, a groundbreaking. “This day has been a long time coming,” Obama said during the ceremony. Today the 400,000-square-foot museum stands on the National Mall near the Washington Monument. The art of the Yoruba people, with origins in Nigeria and Benin, inspired its tiered facade. In 2012, NPR’s Melissa Block talked to Phil Freelon, architect of record for the project, who described other influences that led to its design. The majority of the exhibition space is underground. On the bottom level, museumgoers will find themselves in literal and metaphorical darkness: slavery. 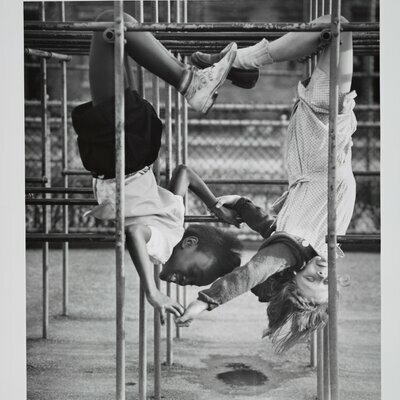 Then, as they ascend, visitors move through exhibits exploring the Jim Crow era and the civil rights movement, until finally reaching light and joy — above-ground galleries devoted to culture, music, dance, literature. “The Power of Place,” an exhibition on the third floor, is about “the diversity of African-American history and culture across a wide expanse … thematic, chronological and geographic,” Paul Gardullo, one of the museum’s curators, recently told NPR. 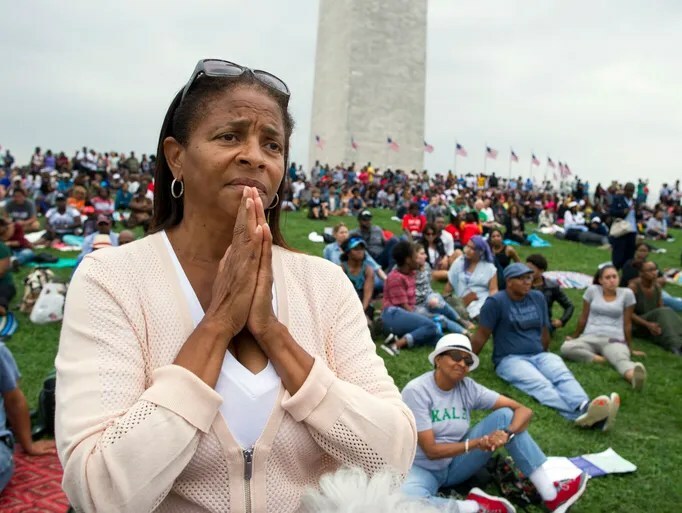 POWERFUL IMAGES OF AFRICAN-AMERICANS WHO WITNESSED THE OPENING NEED NO WORDS! – TOLA. That method of organizing the vast collection — and the choices made for exhibits — seems to hew closely to a hope the president expressed back in 2012.